If you're looking for a career-oriented book to anchor your web programming curriculum, this is a great choice. It lets you teach your students how to build web applications as a first course in programming. But it also lets your students build out their PHP and MySQL skills to a professional level. As a result, it can be used for both beginning and advanced courses. Murach books are always excellent. When I started working with PHP, I was hoping they would release a PHP book. I am thrilled with this book…. It is an excellent learning book, as it walks through all features, but it also is an excellent reference book for advanced programmers. I highly recommend this for PHP and MySQL programming." This book gets your students started with PHP and MySQL as quickly as possible and then builds out their skills in a professional way. To present the whole array of PHP and MySQL skills in a manageable progression, this book is divided into four sections. When your students finish this section, they will understand how all the pieces of a web application fit together. They will be able to build database-driven web applications of their own. And they’ll be ready for rapid progress in the sections that follow. This section expands upon the PHP skills of section 1 with arrays, functions, cookies, sessions, regular expressions, exception handling, libraries, classes and objects…and much more! The last application in this section illustrates an object-oriented approach to data validation that can be used as a model for validating user input...and you won’t find anything like that in most competing books. These are the skills that ensure that web applications come across as trustworthy, reliable, and fully professional to the users. Then, the last chapter in this section shows how to put everything together in an e-commerce web site. All HTML and CSS has been updated to use the best HTML5 and CSS3 practices. Improved coverage of security has been integrated throughout the book, including how to prevent cross-site scripting (XSS) and SQL injection attacks. A third appendix shows how to install all software and source code on Linux. Because section 1 presents a complete subset of PHP and MySQL in just 6 chapters and 204 pages, your students are ready for substantial projects much sooner than they are with competing books. The next three sections present all of the other skills that your students need for developing web applications at a professional level. That brings a level of relevance to the course that isn’t matched by competing books. To show your students how all of the pieces of a professional PHP and MySQL application work together, this book presents the HTML, PHP, and MySQL code for 16 real-world applications. As we see it, the only way to master PHP programming is to study the code in non-trivial applications like these...but this is a missing ingredient in other books. Because this book works for students with no programming experience, it can be used as a first course in programming. In that case, section 1 teaches your students how to use PHP and MySQL to develop a complete database application. That is an exciting accomplishment in just 6 chapters. Then, you can add to that skill set with selected chapters from sections 2, 3, and 4. 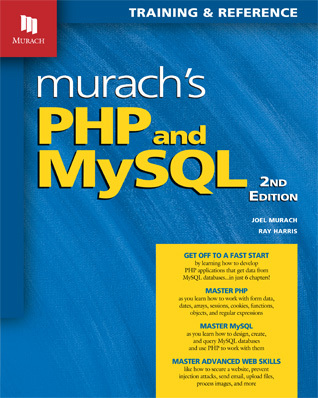 If your students have some programming experience, this book works great for a one- or two-term course in PHP and MySQL. Even then, you probably won’t be able to assign all of the chapters and exercises in the book or all of the exercises and projects in the instructor’s materials. But no matter how far you get, your students will be mastering skills at a professional level. Both are available for free, and both can be used for entering and editing HTML, CSS, and PHP code. But another option is to use NetBeans, which we recommend instead of a text editor. If you would like your students to use an Integrated Development Environment, we recommend the NetBeans IDE for PHP. It includes a text editor that lets your students enter and edit code. It provides an easy way to run applications. And it provides special tools that help your students debug their applications. To test any web application, including PHP and MySQL applications, your students need one or more web browsers. For that, we recommend Google Chrome, Mozilla Firefox, and Internet Explorer. To help your students install these products, the appendixes provide the website addresses and procedures that they will need for both Windows, Mac OS, and Linux systems. In the book, appendix A (for Windows), appendix B (for Mac), and appendix C (for Linux) give your students complete instructions for downloading and installing these items on their own systems. The code presented in chapter 22 (pages 732-743) that uses the YouTube API doesn’t work. Why not? This book shows how to work with version 2 of the YouTube API. Unfortunately, YouTube stopped supporting this version of its API sometime in December 2015. As a result, the code presented on these pages no longer works correctly. To get this code to work correctly, it needs to be updated to use version 3 of the YouTube API.